The Mangalica breeding began in 1833 by the Hungarian Royal Archduke Jozsef. It is known as the superiour family of the Iberico race and carries in Hungary the name Mangalitza. It is also called wool swine because of its curling blonde fleece. 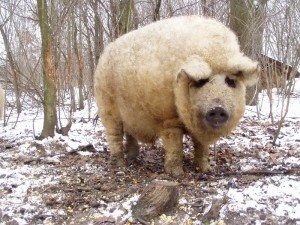 Unlike all popular breeds of hogs, which are meat-type, the Mangalica is an extreme lard-type breed. Meat-type breeds efficiently produce lean meat. 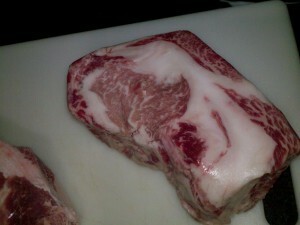 Lard-type breeds produce high-quality fat and very marbled, juicy and flavorful meat. Raised properly the Mangalica’s genes allow it to produce some of the world’s best meat and fat. Mangalica fat is more unsaturated than normal pig fat, so it tastes much “lighter”, “cleaner” and melts at a lower temperature. The fat is also healthier and keeps longer, due to higher levels of oleic acid. The Mangalica meat is beautifully marbled, sporting a rich, crimson flesh that more closely resembles beef in appearance, swathed with a deep layer of flavorful fat which dissolves on your tongue. It has a beautiful red colour and is visible veined with gentle greases, which ensures a pleasant sweet taste. The special qualities of Mangalica fat allow it to be whipped like cream. The fat can be air-cured and served in thin slices. The exceptional meat and fat quality of Mangalica set it apart and explain why professionals use it in ways they’d never use other pork.